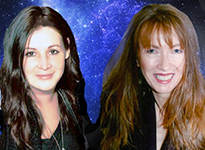 Today you may have to step up and approach your responsibilities from a more serious and authoritative standpoint. The Emperor card is all about power, success, reputation and public standing. But these are all relative terms and are not necessarily related to profession. They’re just as likely tied to responsibilities around the home or within a group of peers. 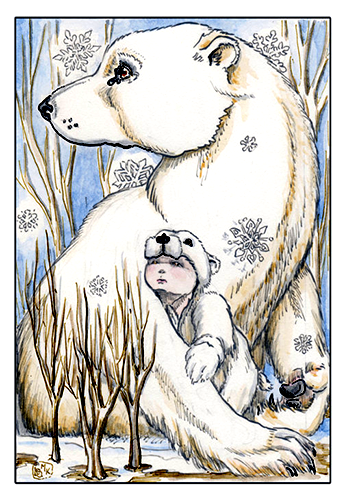 In this version of the card, the Emperor is a polar bear looking off into the distance as he keeps protective watch over a young changeling child. The ground is frozen solid, what little brush there is is sparse and snowflakes are falling all around them. As fierce a guardian as this papa bear may be, there’s a gentle element to the way he protects the child. This is very fitting of the Emperor archetype, which is also quite fatherly and paternal. Although there are masculine elements to the Emperor card, the references don’t only apply to men. It can refer to a single mother, a career-woman, or a woman with important responsibilities as well. It can also refer to a man in your life (or someone new coming in) who embodies these qualities. The message behind this card is one of taking care of business. It’s not the time to be passive or wishy-washy. It’s all about stepping up and taking control of a situation that requires a firm hand and authoritative presence. Whether you are a parent doling out “tough love” or a supervisor having to strong arm an employee or just taking back your power in a personal relationship, remember it’s important to temper that with kindness and compassion. Just like the bear in our card, a protective gentle approach is just as important as a firm steady hand.